The Netherlands were credited with the second chance in group B, due to the fact that they were playing against the reigning champions. 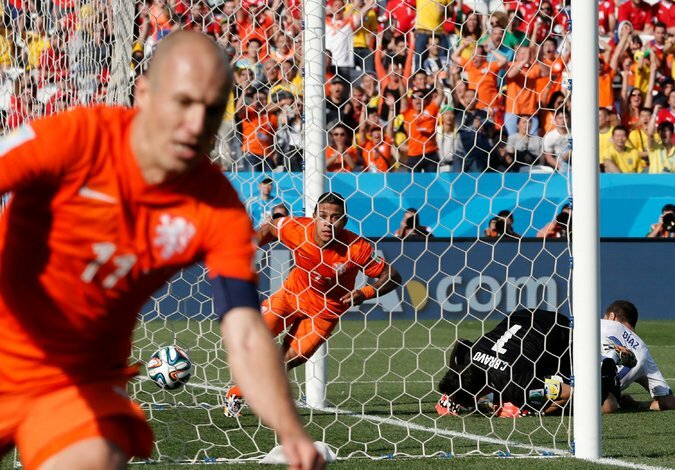 The last time the two teams met at the World Cup, it was they who prevailed in overtime, but on this occasion, the Dutch had it their way. They showed tremendous fighting spirit and found the resources to offset a one goal handicap, as a result of Spain being awarded a penalty. At the end of the match, they had scored five goals and turned into favorites to win the group. This is exactly what happened and there were very few who expected otherwise, but the most impressive part is that they managed to win all the games. The confrontation against Australia was surprisingly difficult, after the underdogs scored twice, but they couldn’t hold on to their lead. Chile also gave them a run for their money, but two goals scored late in the game were enough to wrap things up and now the Netherlands is gearing up for a confrontation against Mexico. The North Americans are not to be trifled with and their actions speak louder than words, with the scoreless draw against Brazil being the most impressive result so far. Mexican players are a mix of experience and enthusiasm, a combination that proved fatal for Croatia in the third and decisive match of the group stage. Against the Netherlands, they need to be wary, because venturing too far into the opposite half, can lead to dangerous counterattacks. Robben and van Persie are definitely the players to watch for in this match, because both of them have scored three goals so far and are well capable of putting the ball past the Mexican goaltender. Both players have the ability of shooting from outside the box, which means that the best defense for the Mexicans is to exercise constant pressure. There is no point in trying to annihilate individual strikers, because the Netherlands have too many options and poor allocation of resources can prove fatal. The Mexicans are not necessarily hopeless, because they have the likes of Dos Santos and Peralta who played in all three games so far and did a wonderful job. Both of them shoot from outside the box and are dangerous at corners and free kicks, but they are unlikely to be presented with too many opportunities to score. They need to be more clinical and make the most of the few scoring opportunities, something that they failed to do in the previous three games. Bookmakers are not overly confident about the Netherlands’ ability to win, but they still offer lower odds for the Europeans at 2.15. Past performance also suggests that Mexico is the big underdog, as the two teams met on four occasions and it was the Dutch who prevailed three times while drawing once in overtime. The bottom line is that punters should not go against the current and back the favorites to prevail now, before the odds eventually drop.